chain of years and the ages’ flight. Aldus Manutius (ca. 1452–1515) was born in the small town of Bassiano, about 40 miles southeast of Rome. He studied under the great classical scholars of his day, and by 1480 obtained a position as private tutor to Alberto and Lionello Pio, the young nephews of the great Renaissance philosopher Giovanni Pico della Mirandola. Around 1490, Aldus decided to leave the comfortable and contemplative life of a scholar and tutor, and move to Venice to enter the cutthroat world of printing. In the years that followed, Aldus printed no fewer than thirty first editions of Greek literature, developed and refined Italic and Greek typography, and launched the “portable library” of little books that allowed reading this literature to become a personal pursuit for the first time. No single individual is more responsible for the preservation of the classical tradition. 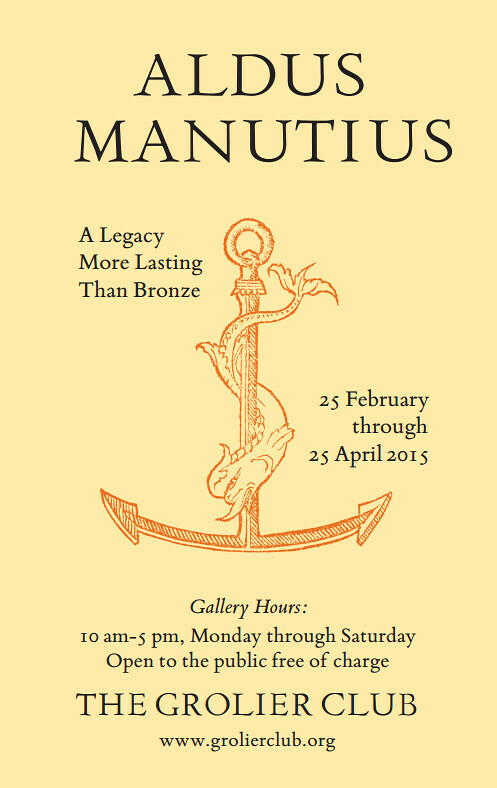 In this 500th year after Aldus’ death, Aldus Manutius: A Legacy More Lasting Than Bronze explores the enduring influence of Aldus and his successors on the development of classical scholarship, typography, book design, production, publishing, and collecting. Curated by G. Scott Clemons and H. George Fletcher, 2015.